This evening is going to be big! Come for the music of Spyro Gyra’s Jeremy Wall and Motherland Rhythms’ Arthur Lorde, hear from our 2017 candidates, enjoy light refreshments, and help us reach our $10,000 goal for campaign supplies. RSVP at www.strongeastramapo.org/rsvp now. Green Meadow Waldorf School is offering a limited number of scholarships to local students entering Grades 8, 9, and 10 in the 2017-18 school year. Partial and full scholarships are available, in order to make enrollment possible for students who otherwise could not afford to attend. You can learn more about Green Meadow at www.gmws.org. There also will be an Introductory Session on April 21. Please contact Melissa McDonagh, Admissions Director for Grades 1-12, with any questions or to apply. She can be reached at 845.356.2514 x302 or mmcdonagh@gmws.org. Polling places will not change this year. The school board president has removed the plan from his agenda. May 16, 2017 is the Board and Budget Vote. We are standing up for ALL of our children! What about you? Can we count on you to participate? 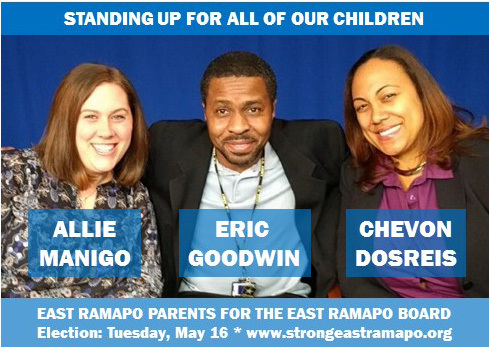 The East Ramapo Board wants to switch people’s polling places eight weeks before the election. That will cause chaos and confusion, and the NAACP is opposing this decision. Tell the board what you think by signing this petition. Then come to the board meeting on March 14 at 7:30 p.m. at 105 S. Madison to raise your voice! 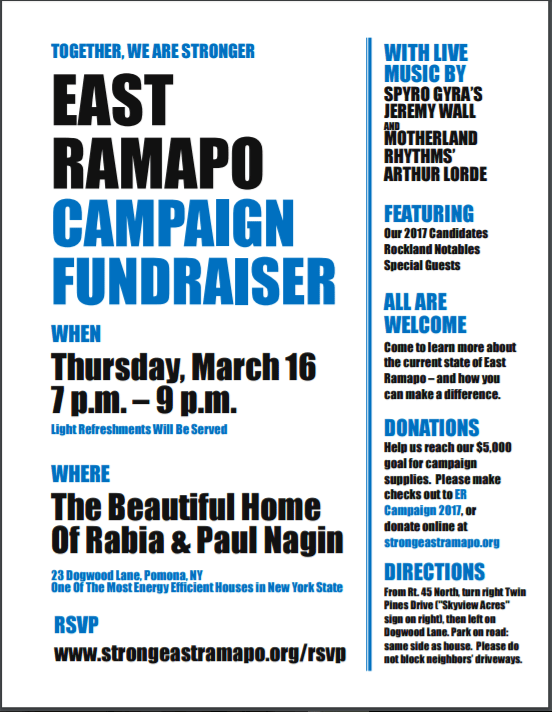 PLEASE JOIN US IN SUPPORTING OUR EAST RAMAPO STUDENTS! Thank you to all who helped make the 2017 forum a success. Everyone was very impressed with 10 fantastic people willing to serve on our school board! They all presented exactly the wide variety of skills and backgrounds that the Center for Public Education says are necessary for a well functioning school board. Since 2009, we have come together each year to coordinate our efforts. We have helped 18 candidates to run, 5 of which have been successful. The only prerequisite is to be a team player. This year the room was packed and many questions were asked. “How will you accomplish your goals as a minority member on a board?” and “Will you support the team even if you are not a candidate this year?” were among many questions asked and answered. At the end of the evening we all wished that every one of these smart and generous people could win a seat on our board this year! But that will have to be a multi-year campaign as there are only three seats up each year. Those who have had experience running campaigns review all the information and put together a slate and backups (In case a candidate can’t continue, for instance illness, it has happened three times!). Those who were willing to be candidates are automatically backups, and often become the hardest working volunteers – which is the best preparation for being a candidate when the next election comes up in 364 days. The three candidates chosen by the review committee this year are Allie Manigo, Chevon DosReis, and Eric Goodwin. We wish them all the best of luck and promise to work hard to elect them to our school board. The others who offered to serve this year were Joan Golden, Jordan Spells, Malcolm Stewart, Benny Everheart, Kat Cancio, Brandon Smith and Jean Fields. We all want to support better education for our children (we consider every child in the district as ours) and an election campaign offers opportunity for concrete action, such as putting up signs, making calls, knocking on doors, passing out literature, making a financial contribution. We do need to remember that all of these actions have the potential benefit of helping our neighbors become more informed, involved, and active, whatever the outcome of the election. Our participation at the event and in the campaign is our way of showing our children and our neighbors that an active life is meaningful. Thursday, March 16 at 7 p.m.